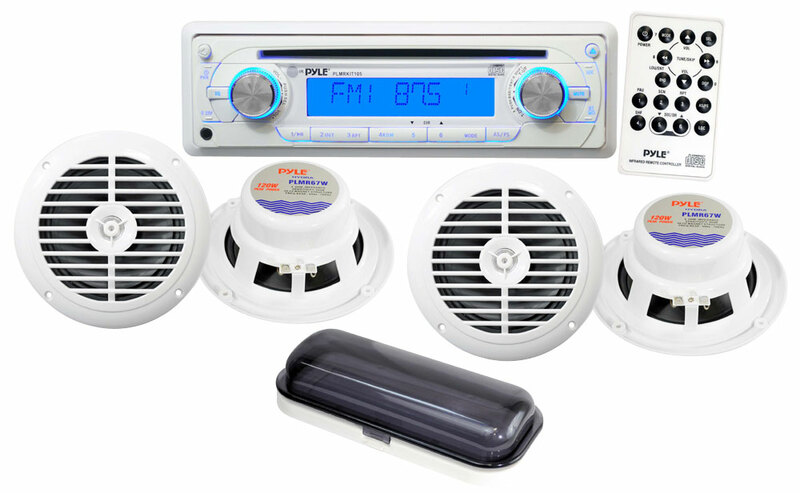 Take your marine audio to the next level with this awesome audio kit, including a headunit with CD/MP3 playback capabilities, four white 6.5” speakers, and a waterproof cover for the headunit. When it’s too wet, cover up your headunit using the included splash proof housing, with a smoke tint for sun damage protection as well. The included head unit is packed with tons of features. Insert a CD, CD-R, or CD-RW loaded with music. Use the AM/FM radio to listen to music the traditional way. Or, plug in your MP3 player using the aux-in port on the front. For security and protection, detach the faceplate and store it in the included case. The PLMRKIT105 is equipped with a conveniently-located 3.5mm (1/8") auxillary input jack on the front. Using a 3.5mm male-to-male cable (not included), you can connect any digital music player, like an iPod, iPhone, or Zune. There's no need to burn a ton of CDs with all your music or rely on the radio — just bring your player and your favorite playlists! Or, use a music-playing app on your smartphone, like Pandora or Spotify. This head unit is rated at 4 x 50 watts, so each speaker has plenty of independent power. And it comes with everything you’ve come to expect from a modern head unit: 3-beam laser tracking, anti-skip mechanism, loudness settings, and a 24 radio station memory. The LCD screen is backlit in a cool, modern blue, and shows relevant track info. A wireless remote control means you can change tracks without having to get up. Now you can tweak the sound to your exact specifications using the PLMRKIT105's built-in equalizer controls. With the ability to adjust the bass, treble, fader, and balance to your liking, you'll get your sound how you want it. The PLMRKIT105 includes 2 of our PLMR67W speakers. These 6.5" speakers are completely waterproof, feature a polypropylene cone, 1" voice coil, and a 20 oz. magnet. The slim mounting depth of 2" makes them perfect for any marine application. These speakers don't just sound great — they look great, too, thanks to the sea-inspired accents. Two-way speaker technology ensures you get the full audio spectrum on your audio playback — they boast a frequency range of 45 Hz to 16 kHz. The PLMRKIT105 includes a plastic weatherproof shield that protects your headunit from the elements. The tinted plastic prevents damage and cracking due to sun exposure while also keeping moisture out. The PLMRKIT105 is easy to install. Included with your kit are installation instructions, mounting brackets & hardware, plus wires. Take your marine audio to the next level with this awesome audio kit, including a headunit with CD & MP3 capabilities, four 6.5' speakers, and a waterproof cover for the headunit. The included headunit is equipped with an AM/FM radio, single-disc CD player, and MP3 playback. The anti-skip mechanism means your music will play smoothly even on the roughest of seas. And you can use the auxiliary input to hook up another digital music player, like an iPod or Zune. Store up to 24 stations in the headunit's built in memory and easily navigate between stations and tracks using the intuitive interface and beautiful blue-backlit LCD screen. When it's too wet, cover up your headunit using the included splash proof housing, with a smoke tint for sun damage protection as well. Wire it up to the two pairs of included 50 watt speakers, and be ready to rock out at sea! Also includes a fully functional wireless remote control. Color: white.